Celebrate the joyous sound of Spring with this delightful bird house charm and its happy little song bird. 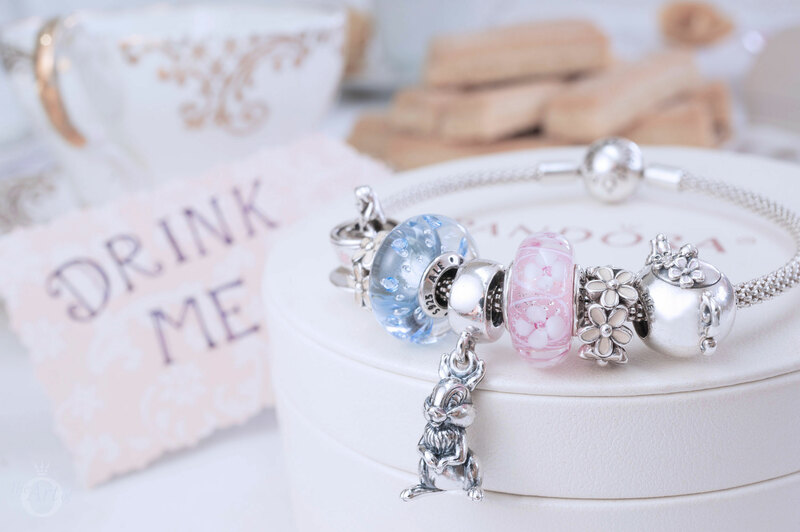 The recent PANDORA Spring 2018 Collection was refreshing for many reasons; we had the release of the exciting new PANDORA Shine range, creative new charms such as the fun Bella Bot Charm with its movable limbs as well as a burst of cute Disney charms! The cheery PANDORA Spring Bird House (797045) charm was another reason why I particularly found the Spring Collection exhilarating. 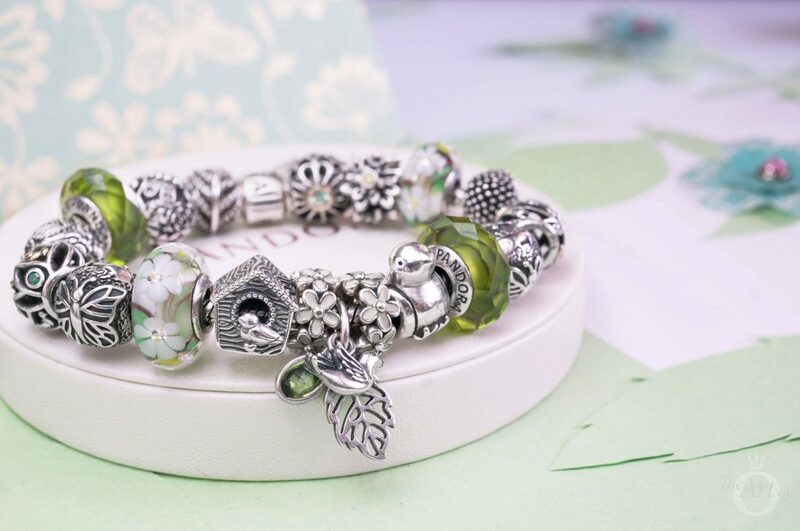 The PANDORA Spring Bird House charm is exactly the style of charm which initially attracted me to PANDORA. The detail in its various elements is stunning and it has a charming theme which can be used to symbolise multiple occasions. It is a chunky, oxidised silver charm and doesn’t feature any cubic zirconia or enamel. Whilst I do appreciate that subtle use of enamel and cubic zirconia can beautify and enhance charms, occasionally it has been used excessively and I’m glad that the Spring Bird House charm is plain silver. 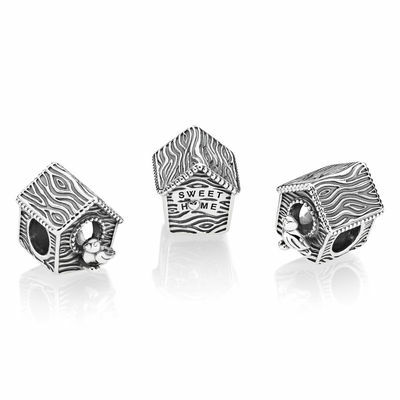 The overall shape of the Spring Bird House charm is similar to the classic Home Sweet Home (791267) charm and they could work well together on a bracelet design. The Spring Bird House charm is slightly more tapered at the bottom and has an interesting pattern to portray the knots and grains in a wooden structure. PANDORA often include discreet love hearts which are artfully incorporated into the charm. If you look carefully at the Spring Bird House charm, you will notice a love heart on the end of the little post the bird is sitting on! The wooden motif continues around the Spring Bird House’ roof and sides, with graceful beaded adorning the edge of the roof and the entrance. The dainty Spring bird has a plump and healthy appearance and delicate lines trace its wings and eye. 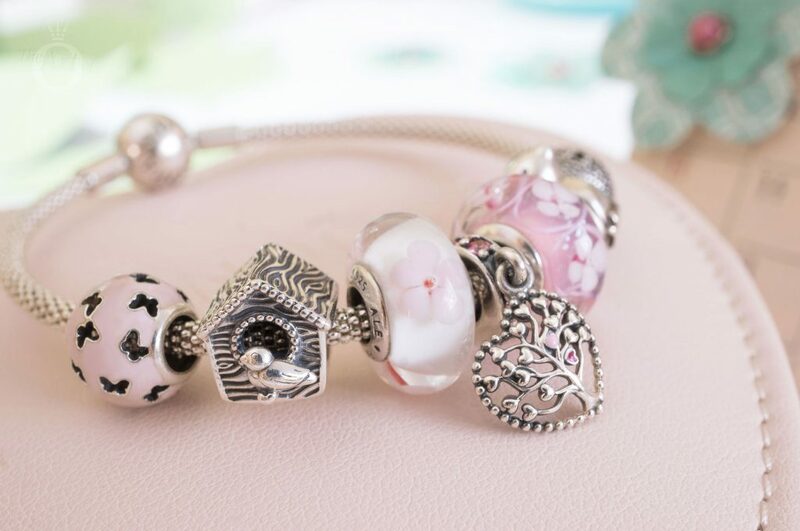 The PANDORA Spring Bird House charm really is full of charming details. Apart from the love heart on the end of the post, there is also a tiny leaf at it’s base. From the side angle the post looks branch like and appears to be growing out of the bird house. PANDORA has started to use some different hallmarks on recent jewellery, including the Spring Bird House charm. The hallmark is quite large but does not interfere with the beauty of the charm as it is on the base. The new hallmark is ‘P2 S925 ALE’. I was surprised to discover that despite being a chunky and solid looking charm, the Spring Bird House charm is not threaded. In retrospect this makes sense as even without a threaded interior the charm is quite weighty. 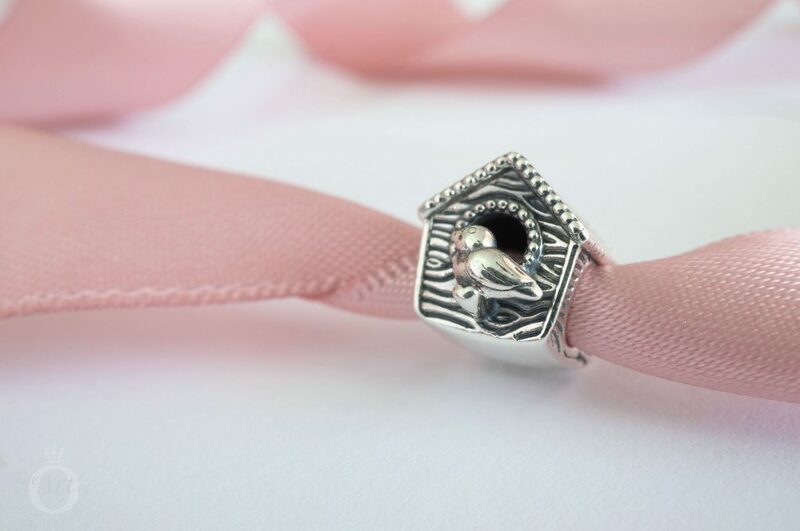 The back on the Spring Bird House charm features the expression ‘Sweet Home’ engraved with an embossed heart in place of the letter ‘o’. 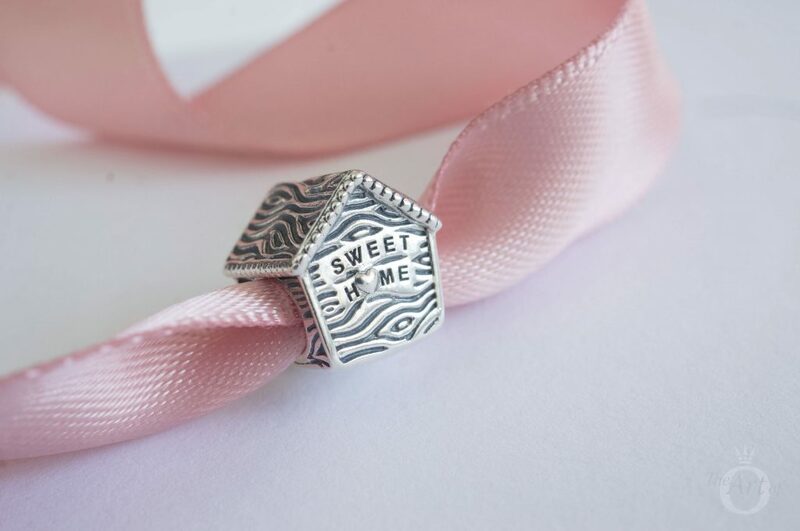 This cute message makes the Spring Bird House charm an ideal gift for someone who has just moved to a new house. Or perhaps a melancholy memory for a mother whose child has recently left the nest. 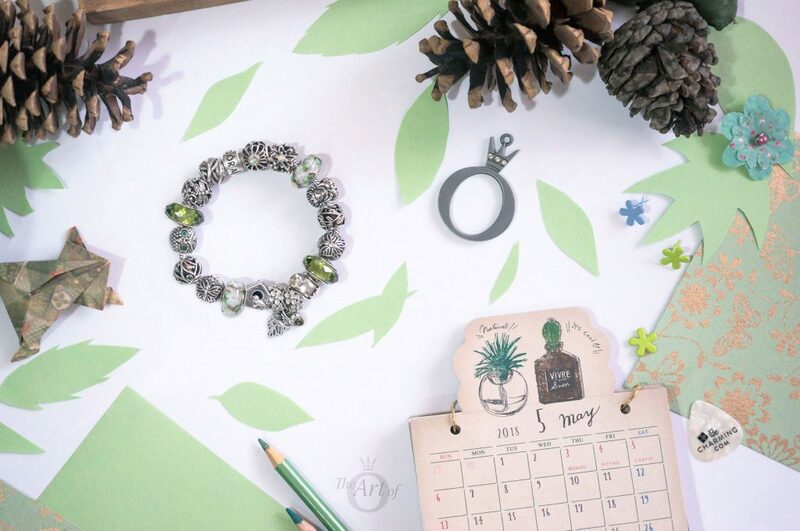 My first bracelet design with the PANDORA Spring Bird House charm is titled ‘Wild Wood’ and includes woodland animals, white blossoms and forest greens. I wanted this design to be simple and have a natural feel and used the classic PANDORA Moments Barrel Clasp Bracelet (590702-HV). The Forest Trinity Pendant (791214PE) with its gorgeous green peridot gemstone sits at the centre of the bracelet, flanked either side with the Darling Daisies Spacers (791495EN12), Spring Bird House and Happy Little Bird (790424) charms. The retired Wild Flower Murano (791638cz) and Fascinating Olive Crystal (791729nlg) charms continue the woodland theme with their dreamy green hues and the majestic Vintage Allure (791173ssg) charm adds a splash of glamour with its striking green spinel stones. The stunning Vintage Allure charm is retired but BeCharming.com still have a few in stock if you are quick! If you would like to purchase the Fascinating Olive Crystal charm, it is currently in the PANDORA sale on the PANDORA Germany eStore for a fabulous €19! My second styling is loosely inspired a song that always makes me smile, ‘Birdhouse in Your Soul’ by American band They Might Be Giants. As it is a fun, happy feel-good song, I created a bracelet design to match. 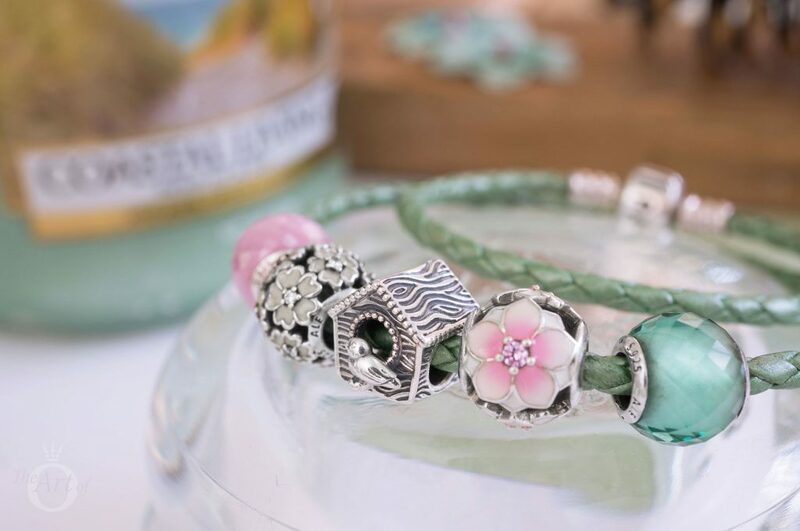 The Spring Bird House charm is the centrepiece and the Mint Glitter (791669) and Ice Drops Murano (796365CZB) charms provide a relaxed coastal vibe with their ocean shades and sand like glitter. The new Moments Sliding Bracelet (597125CZ) is perfect for this breezy, laid back style and the clear stones on the end caps add just the right amount of sparkle. Blue canary in the outlet by the light switch, Who watches over you, Make a little birdhouse in your soul. My third styling is dedicated to the colour theorists that make up rules on what to wear and say silly things like, “Pink and green should never be seen”! Pink and green is one of my favourite colour combinations and I love the fresh, energetic feel of this bracelet design. 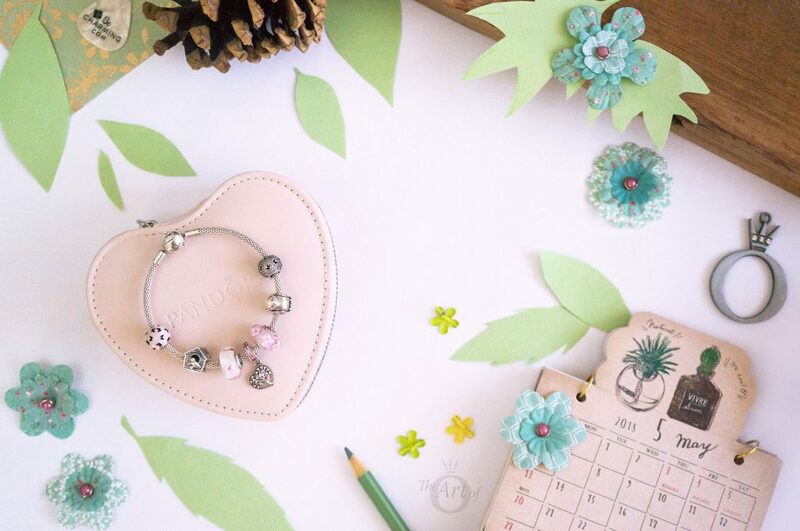 The Light Green Double Leather Bracelet (590705CLG-D) is ideal for the warmer weather we have been having and the Pink (791499PCZ) and Green Petite Facet (791499SGQ) charms provide bold colour to this simple styling. The chirping bird in the Spring Bird House charm is surrounded by the fragrant flowers of the White Primrose Meadow (791488EN12) and Magnolia Blooms (792087PCZ) charms. There is still a selection of items in the PANDORA sale on the PANDORA UK eStore including the Green Petite Facet which is now £19. When birds do sing hey ding a ding ding, sweet lovers love the spring. My final design is full of love and romance and would be wonderful to wear to Spring wedding! The sweet Tree of Love Pendant (796592CZSMX) sits at the centre of the Mesh Bracelet (596543) and the pretty pinks from the Cherry Blossom (790947) and Pink Field of Flowers Murano (791665) charms emphasis the tiny enamel hearts on the the tree. The Happy Little Bird (790424) charm sits opposite the Spring Bird House charm and the Pink Fluttering Butterflies (791483EN68) and Fluttering Butterflies (791482CZ) charms complete this amorous design. 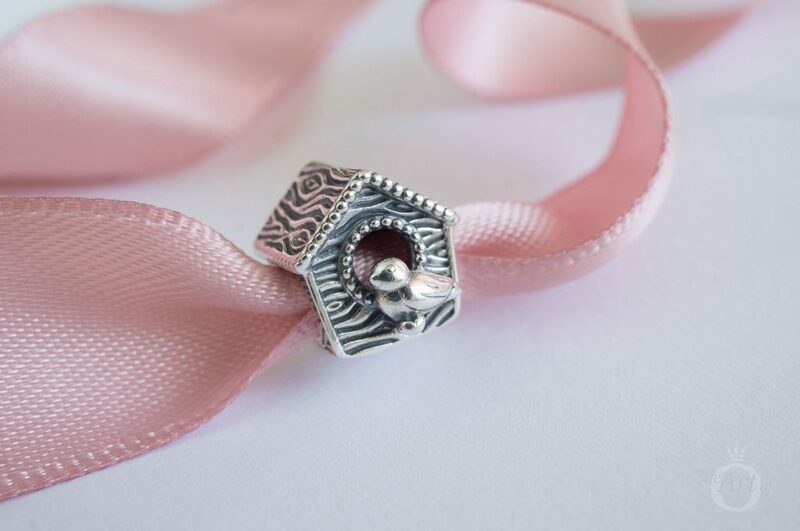 My verdict on the PANDORA Spring Bird House Charm? It's a real tweet! 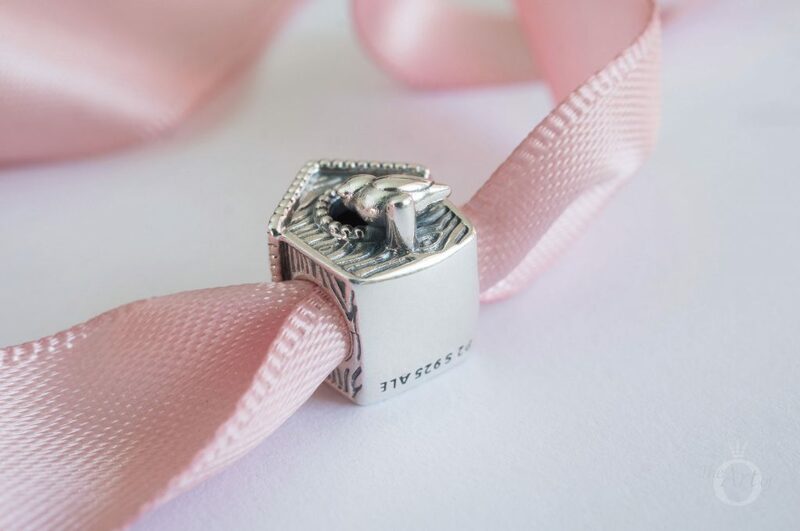 The design of the PANDORA Spring Bird House charm is beautiful and full of detail but as it isn’t really a charm that grabs attention and so the wow factor is a little lower. The price is reasonable but as the charm doesn’t include any enamel or gemstones I believe it could have been a bit cheaper. 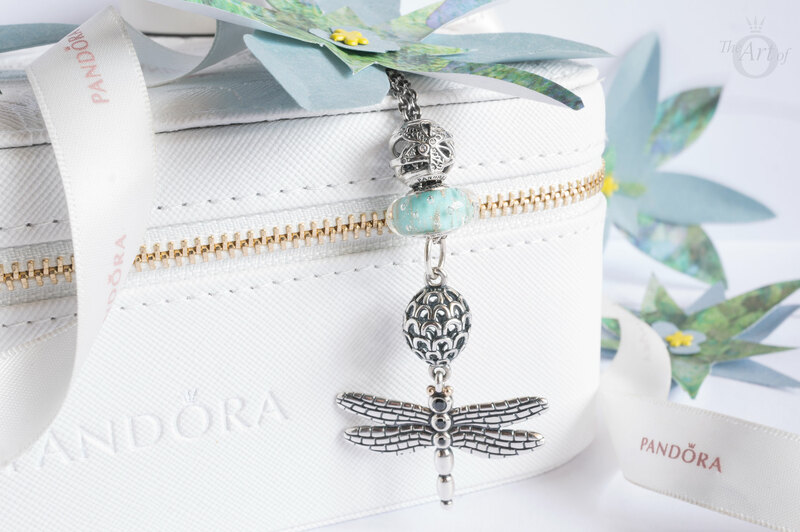 In the UK the PANDORA Spring Bird House Charm (797045) is £35 and is available from the PANDORA UK eStore. I’m so glad your mother loves her gift! 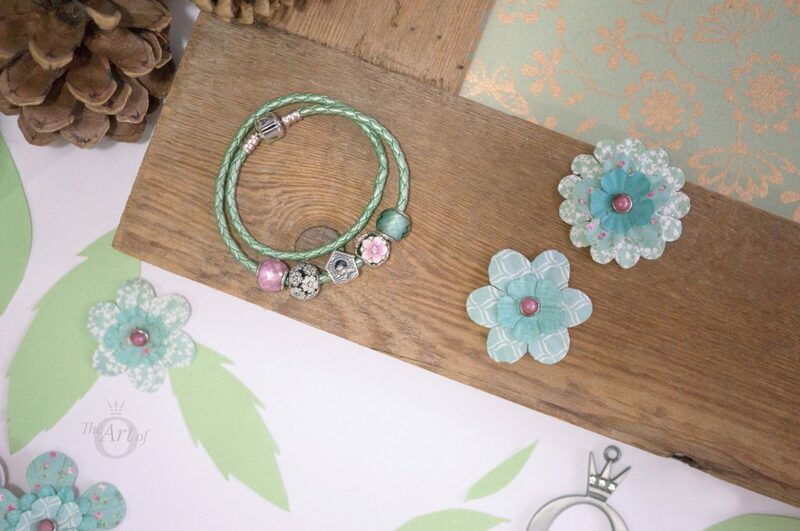 The Spring Bird House Charm is very pretty and can be styled so many ways. Although I don’t mind the occasional use of enamel and cubic zirconia on charms, it can sometimes restrict styling options. I really hope to see more charms in this older PANDORA style released. The bird house charm is super cute. It is such a perfect resemblance for the spring weather. I love how you have styled the charm various types. 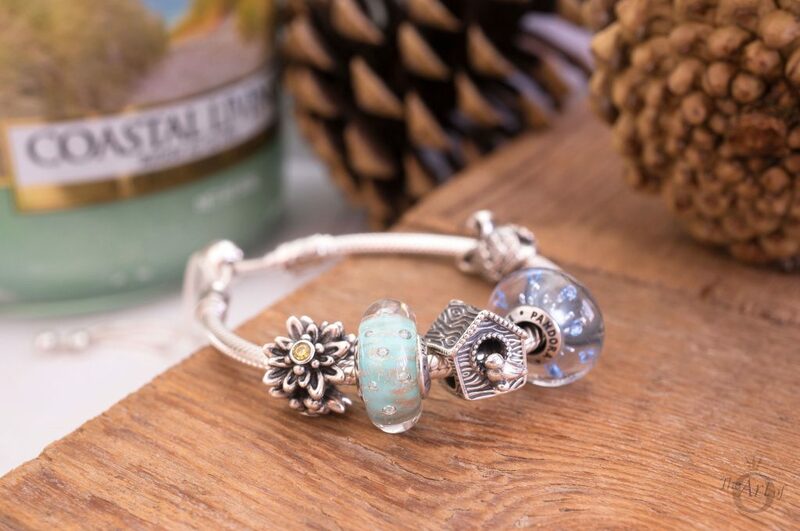 It looks absolutely stunning with the wild flower muranos as well as the other floral charms. Perfection. Thank you for your kind comment! 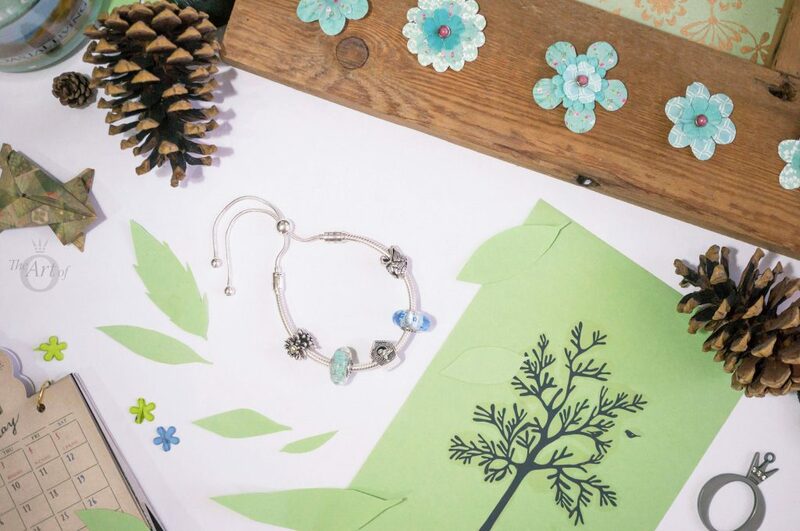 Charms like the Spring Bird House are easy to style and be integrated into a collection. I’m really pleased that PANDORA appears to be listening to their fans and have produced a simple but beautiful charm like this. I’m a bit sad though that so many of my favourite charms are now retired. I hope it is to make way for some more gorgeous charms like this one. Thank you for sharing your views and enjoy your week! 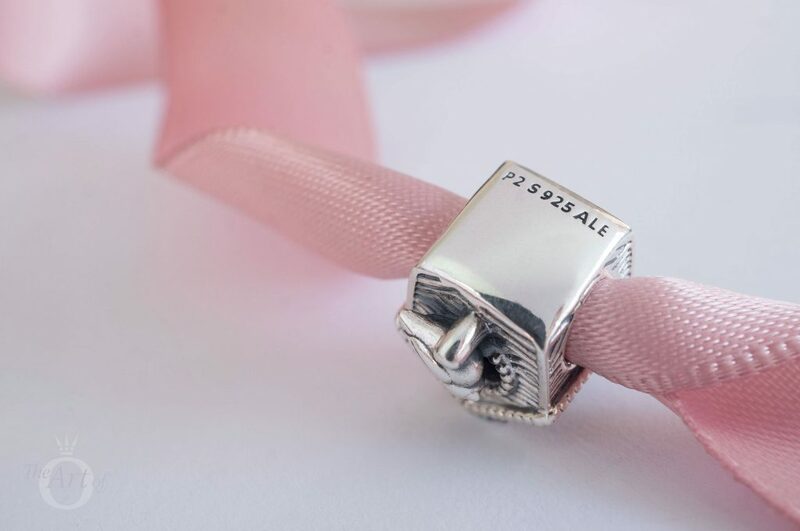 Such a cute charm, and I absolutely love your styling of it! Thank you! It really is a sweet charm and I hope PANDORA releases more charms of this ilk. I was trying to remember if there is a Bird House in any of the Disney stories so I could create a Disney bracelet. Can you think of any? Thanks for commenting and enjoy the rest of your weekend! I just love the spring bird house! Thank you for the detailed look at it. It’s such a precious charm! I loved the photos you took of it, so creative and fun! Thank you for your kind comment! I really enjoy taking photos of the charms and trying to find all the little details. 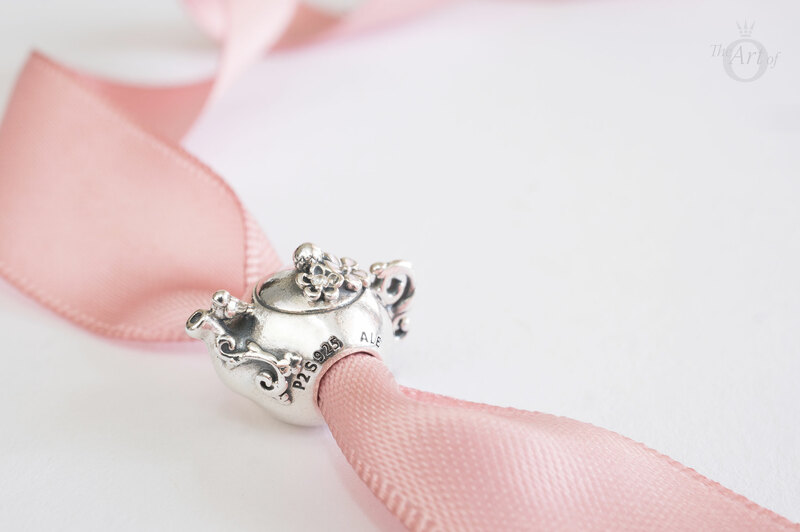 Looking for the hidden hearts on PANDORA charms is like playing a hide and seek game! 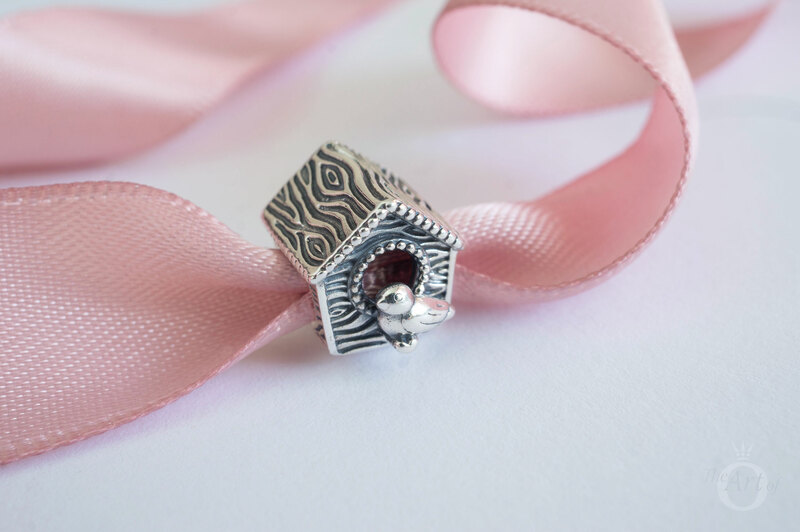 Have you bought the Spring Bird House Charm or is it on your wish list? I’m glad I helped add a meaning to the Spring Bird House Charm for you and I love your creative thinking behind the Disney car charm! That’s excellent! I am going to Disney World for the first time later this year and for me the Disney Vintage Car can represent my husband and driving off to have a magical time!